PRODUCT DESCRIPTION: Wood house which is constructed of pine with a cedar roof. 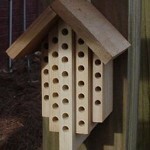 The pine body part has holes drilled to the size Mason Bees like so they will take advantage of this prime nest sight. This block has 32 holes and each one is about 3-4 inches deep. 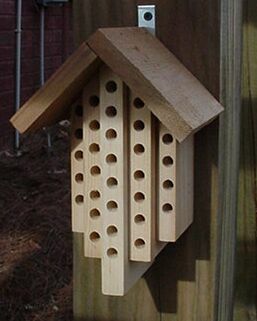 WHERE TO USE IT: Try to hang it on a tree, house or any structure where it has southern exposure. RATE OF APPLICATION: Setting out several close to each other is not a problem since these bees are not territorial. The more you have out the more you will get nesting. Once occupied you can move them around if wanted to help set them out better for the landscape. Have not even installed them yet, but I will say that while I questioned the price when I ordered two of them, they are very high quality. Company shipped on time and they were well packaged and ready to put up. Thus far I am impressed.